The central focus of my research is to explain coastal behaviour, system dynamics and mechanisms of forcing over decadal to century timescales. In particular, my research explores the relative importance of intrinsic system control versus external climate forcing on the geomorphology and morphodynamics of coastal sedimentary systems. I am also interested in understanding and capturing the geomorphological controls on coastal ecosystems. Knight, J. and Burningham, H. (2019). Sand dunes and ventifacts on the coast of South Africa. Aeolian Research 37, 44-58. https://doi.org/10.1016/j.aeolia.2019.02.003. Gardner, E., Burningham, H. and Thompson, J.R. (2018). Impacts of climate change and hydrological management on a coastal lake and wetland system. Irish Geography, in press. Varandas Martins, S., Burningham, H. and Pinto-Cruz, C. (2018). Climate variability impacts on coastal dune slack ecohydrology. Irish Geography, 51 (2). http://dx.doi.org/10.2014/igj.v51i2.1374. Burningham, H., French, J.R. (2014). Travelling forelands: complexities in drift and migration patterns. Journal of Coastal Research SI70, 102-108. Knight, J., Burningham, H. (2014). A paraglacial coastal gravel structure: Connell’s Bank, NW Ireland. Journal of Coastal Research SI70, 121-126. Gardner, E.A., Burningham, H. (2013) Ecology and conservation of the rare annual Petrorhagia nanteuilii (Childing Pink) on the vegetated shingle spits of Pagham Harbour, West Sussex. Journal of Coastal Conservation 17, 589-600 [http://dx.doi.org/10.1007/s11852-013-0257-0]. French, J.R., Burningham, H. (2013). Coasts and climate: insights from geomorphology. Progress in Physical Geography 37(4), 550-561 [doi:10.1177/0309133313494962]. Oyedotun, T.D.T, Burningham, H., French, J.R. (2013). Sediment sorting and mixing in the Camel estuary, UK. Journal of Coastal Research SI65, 1563-1568. Burningham, H., French, J. (2013) Is the NAO winter index a reliable proxy for wind climate and storminess in northwest Europe? International Journal of Climatology 33(8), 2036-2049 [doi:10.1002/joc.3571]. Oyedotun, T.D.T., Burningham, H., French, J.R. (2012). Characterisation of estuary and adjacent beach sediments in the Gannel Estuary, South-West England. Geoscience in South-West England 13, 71-76. Richards, E.G., Burningham, H. (2011). Hippophae rhamnoides on a coastal dune system: a thorny issue? Journal of Coastal Conservation 15(1), 73-85 [doi:10.1007/s11852-010-0122-3]. French, J.R., Burningham, H. (2011). Coastal geomorphology. Progress in Physical Geography 35(4), 535-545 [doi:10.1177/0309133311414606]. Knight, J., Burningham, H. (2011). Boulder dynamics on an Atlantic-facing rock coastline, northwest Ireland. Marine Geology 283(1-4), 56-65 [doi:10.1016/j.margeo.2010.07.008]. Burningham, H., French, J. (2011). Seabed dynamics in a large coastal embayment: 180 years of morphological change in the outer Thames estuary. Hydrobiologia 672 (1) 105-119 [doi:10.1007/s10750-011-0873-3]. Barrett-Mold, C., Burningham, H. (2010). Contrasting ecology of prograding coastal dunes on the northwest coast of Ireland. Journal of Coastal Conservation 14(2), 81-90 [doi:10.1007/s11852-009-0069-4]. Burningham, H., French, J. R. (2009). Historical seabed mobility in an outer estuary - sea basin environment. Journal of Coastal Research SI56, 589-593. French, J.R., Burningham, H. (2009). Coastal geomorphology: trends and challenges. Progress in Physical Geography 33(1), 117-129. Barrett-Mold, C., Burningham, H., French, J.R. (2009). Stratigraphic insights from sedimentary peels of littoral estuarine depositional systems. Journal of Coastal Research SI56, 584-588. French, J.R., Burningham, H. (2009). Restoration of an eroded estuarine foreshore using cohesive dredge material, Orwell Estuary, UK. Journal of Coastal Research SI56, 1444-1448. Knight, J., Burningham, H., Barrett-Mold, C. (2009). The geomorphology and controls on development of a boulder-strewn rock platform, NW Ireland. Journal of Coastal Research SI56, 1646-1650. Burningham, H. (2008). Contrasting geomorphic response to structural control: The Loughros estuaries, northwest Ireland. Geomorphology 97(3-4), 300-320 doi:10.1016/j.geomorph.2007.08.009. French, J.R., Burningham, H., Benson, T. (2008). Tidal and meteorological forcing of suspended sediment flux in a muddy mesotidal estuary. Estuaries and Coasts 31, 843-859 [doi:10.1007/s12237-008-9072-5]. Parrott, A., Burningham, H. (2008). Opportunities of, and constraints to, the use of intertidal agri-environment schemes for sustainable coastal defence: A case study of the Blackwater Estuary, southeast England. Ocean and Coastal Management 51(4), 352-367 [doi:10.1016/j.ocecoaman.2007.08.003]. Burningham, H., French, J.R. (2007). Morphodynamics and sedimentology of mixed-sediment inlets. Journal of Coastal Research SI50, 710-715. Knight, J., Burningham, H. (2007). Coastal morphodynamics and prehistoric human occupation, County Donegal, NW Ireland. Journal of Coastal Research SI50, 104-108. Burningham, H., French, J.R. (2006). Morphodynamic behaviour of a mixed sand-gravel ebb-tidal delta: Deben estuary, Suffolk, UK. Marine Geology 225(1-4), 23-44 [doi:10.1016/j.margeo.2005.09.009]. Burningham, H., Cooper, J.A.G. (2004). Morphology and historical evolution of north-east Atlantic coastal deposits: The west Donegal estuaries, north-west Ireland. Journal of Coastal Research SI41, 148-159. Knight, J., Burningham, H. (2003). Recent ventifact development on the central Oregon Coast, western Usa. Earth Surface Processes and Landforms 28, 87-98 doi:10.1002/esp.432. Knight, J., Burningham, H. (2001). Formation of bedrock-cut ventifacts and late Holocene coastal zone evolution, County Donegal, Ireland. Journal of Geology 109(5), 647-660. Burningham, H. (2000). Short-term changes at an inlet margin dune barrier: Dooey Spit, Gweebarra Estuary, north-west Ireland. Periodicum Biologorum 102(1), 505-511. Burningham, H., Duck, R.W., Watt, A.M. (2000). Perspectives from a newly formed Integrated Coastal Zone Management voluntary partnership: the Tay Estuary Forum (Scotland). Periodicum Biologorum 102(1), 101-105. Burningham, H., Cooper, J.A.G. (1998). Mesoscale evolution of a west Donegal estuary. Journal of Coastal Research, SI26, 24-30. Burningham, H., French, J.R. (2017). Evaluating potential hazards to seafloor infrastructure associated with submarine morphodynamics. CERU Report No. 1711-1. The Crown Estate, 51pp. Burningham, H., French, J.R. (2016). Shoreline-shoreface dynamics on the Suffolk coast. CERU Report No. 1608-1. The Crown Estate, ISBN 978-1-906410-76-6, 117pp. Burningham, H., French, J.R. (2009). Seabed mobility in the greater Thames estuary. The Crown Estate, ISBN 978-1-906410-09-4, 59pp. Burningham, H., French, J.R. (2008). Historical changes in the seabed of the greater Thames estuary. The Crown Estate, ISBN 978-1-906410-04-9, 54pp. French, J.R., Burningham, H., Thornhill, G., Nicholls, R.J. (2016). Integrating estuarine, coastal and inner shelf sediment systems in a common conceptual framework as a basis for participatory shoreline management. In: Meadows, M., Lin, J.-C. (Eds.) Geomorphology and society. Springer. Burningham, H. (2015). 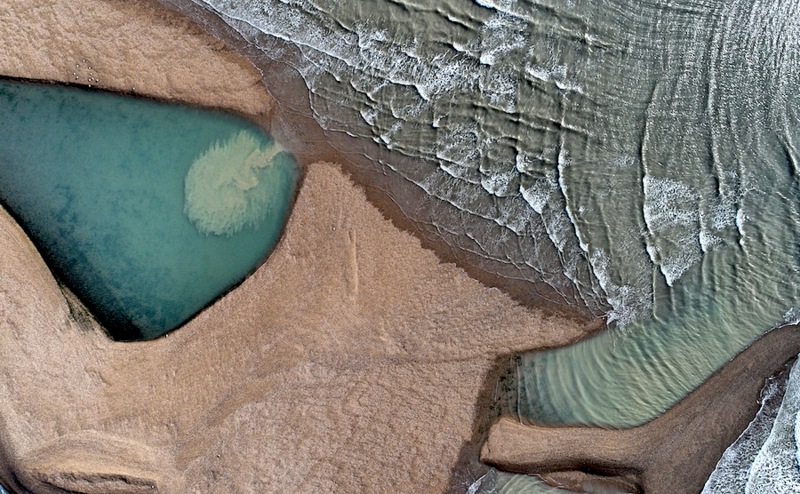 Gravel spit-inlet dynamics: Orford Spit, UK. In: Randazzo, G., Cooper, J.A.G., Jackson D., Sand and Gravel Spits, Coastal Research Library 12, Springer, 51-65. Knight, J., Burningham, H. (2011). Sand dune morphodynamics and prehistoric human occupation in NW Ireland. In Brown, A.G., Basell, L.S., Butzer, A.K.W., Basell, L.S., Butzer, K.W. (Eds.). Geoarchaeology, Climate Change, Sustainability, Geological Society of America, Vol. 476, pp.81-92. Burningham, H. (2005). Morphodynamic Behaviour of a High-Energy Coastal Inlet: Loughros Beg, Donegal, Ireland. In FitzGerald, D.M., Knight, J. (Eds.). High Resolution Morphodynamics and Sedimentary Evolution of Estuaries, Dordrecht: Springer, pp.215-242. French, J. R., Benson, T., Burningham, H. (2005). Morphodynamics and sediment flux in the Blyth estuary, Suffolk, UK: conceptual modelling and high resolution monitoring. In Knight, J., Fitzgerald, D. (Eds.). High resolution morphodynamics and sedimentary evolution of estuaries, New York: Springer, pp.143-171. Karunarathna, H., Horrillo-Caraballo, J.M., Burningham, H., Reeve, D. (2017). Morphodynamic evolution of an estuary inlet. Proceedings of Coastal Dynamics, 74, 1109-1119. Nicholls, R., French, J.R., van Maanen, B., Burningham, H. […] (2015). Improving decadal coastal geomorphic predictions. E-proceedings of the 36th IAHR World Congress, 10pp. Burningham, H., French, J. (2015) Large-scale spatial variability in the contemporary coastal sand and gravel resource, Suffolk, eastern UK. In: Wang, P., Rosati, J.D., Cheng, J. (Eds.) Proceedings of Coastal Sediments, 15pp. French, J., Burningham, H. (2015) Wave-driven sediment pathways on the gravel-dominated Suffolk coast, eastern UK. In: Wang, P., Rosati, J.D., Cheng, J. (Eds.) Proceedings of Coastal Sediments, 15pp. Horrillo-Caraballo, J.M., Reeve, D., Karunarathna, H., Pan, S., French, J.R., Burningham, H.(2015). Multi-scale statistical analysis of the Suffolk coast, UK. In: Wang, P., Rosati, J.D., Cheng, J. (Eds.) Proceedings of Coastal Sediments, 15pp. Nicholls, R., French, J.R., van Maanen, B., Payo, A., Sutherland, J., Walkden, M., Burningham, H. […] (2015). Improving decadal coastal geomorphic predictions: an overview of the iCOASST project. In: Wang, P., Rosati, J.D., Cheng, J. (Eds.) Proceedings of Coastal Sediments, 15pp. Reeve, D., Karunarathna, H., Horrillo-Caraballo, J.M., Pan, S., French, J.R., Burningham, H. (2015). Modelling the medium-term morphodynamic response of a coastal plain region using logical networks. In: Wang, P., Rosati, J.D., Cheng, J. (Eds.) Proceedings of Coastal Sediments, 15pp. Thornhill, G., French, J.R., Burningham, H. (2015). ESTEEM - a new ‘hybrid complexity’ model for simulating estuary morphological evoluation at decadal to centennial scales. In: Wang, P., Rosati, J.D., Cheng, J. (Eds.) Proceedings of Coastal Sediments, 15pp. Walkden, M., Payo, A., Barnes, J., Burningham, H. (2015). Modeling the response of coupled barrier and cliff systems to sea level rise. In: Wang, P., Rosati, J.D., Cheng, J. (Eds.) Proceedings of Coastal Sediments, 15pp. Nicholls, R.J., Bradbury, A., Burningham, H., Dix, J.K., Ellis, M., French, J., Hall, J.W., Karunarathna, H.U., Lawn, J., Pan, S., Reeve, D.E., Rogers, B., Souza, A., Stansby, P.K., Sutherland, J., Tarrant, O., Walkden, M.J.A., Whitehouse, R. (2012). iCOASST - integrating coastal sediment systems. ICCE2012 International Conference on Coastal Engineering, Santander, ES, 01 - 06 Jul 2012, 15pp. Duranel, A., Thompson, J.R., Cubizolle, H., Burningham, H. (2011). Assessing the potential impact of climate change on mire habitats in Central France: a multi-scale eco-hydrological approach. British Ecological Society / Natural England conference: Adapting Conservation to a Changing Climate. Burningham, H., French, J. (2010). GIS analysis of historical marine geomorphology: the outer Thames seabed. Proceedings of GIS Research UK, 14-16 April 2010, 273-276. French, J.R., Burningham, H. (2003). Tidal marsh sedimentation versus sea-level rise: a southeast England estuarine perspective. Proceedings of the International Conference on Coastal Sediments, Clearwater Beach, Florida, USA, 18-23 May 2003, 1-14. Burningham, H. (2002). Meso-scale morphological changes in the Loughros More estuary. Proceedings of Littoral 2002: The Changing Coast 3, 265-270. Burningham, H., French, J. (2017) Evaluating potential hazards to seafloor infrastructure associated with submarine morphodynamics. CERU Report No. 1711-1, Final Report, Crown Estate, 58pp. Burningham, H., French, J. (2016) Historical morphodynamics of the Haisborough Sand bank system. CERU Report No. 162-1, Final Report, Crown Estate, 37pp. Burningham, H., Satchell, J., Grøn, O., Hunniche, T. (2010). Identifying coastal archaeology using multispectral satellite imagery of the intertidal zone: A pilot study. Final Report, English Heritage, 41pp. Whitehouse, R., Balson, P., Beech, N., Brampton, A., Blott, S., Burningham, H., Cooper, N., French, J., Guthrie, G., Hanson, S., Nicholls, R., Pearson, S., Pye, K., Rossington, K., Sutherland, J., Walkden, M. (2009). Characterisation and prediction of large-scale, long-term change of coastal geomorphological behaviours: Final Science Report. Science Report - SC060074/SR2. Bristol, Environment Agency, 281pp. French, J., Burningham, H. (2009). Mapping the connectivity of large-scale coastal geomorphological systems. 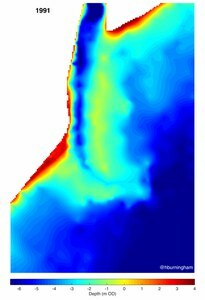 Coastal system mapping with the Cmap Tools tutorial. Environment Agency Project Record – SC060074/PR. Burningham, H., French, J.R., Karunarathna, H., Morris, K., Reeve, D. E., Townend, I., Williams, A. (2007). Development and demonstration of systems-based estuary simulators. Report FD2117/TR. Defra. Burningham, H. (2004). Coasts: form, process and evolution (Woodroffe, C.D., 2003). Transactions of the Institute of British Geographers 29(1), 140-141. Burningham, H. (2006). Introduction to Coastal Processes & Geomorphology (Masselink, G. & Hughes, M.G. 2003). Journal of Coastal Research 22(6), 1589-1590. 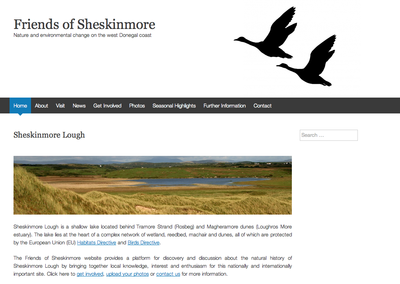 With the help of Beacon Bursary funding from UCL Public Engagement Unit, we have launched the Friends of Sheskinmore - a natural history interest and research group in northwest Ireland comprising local people, environmental/conservation managers, visitors and research scientists, supported by the sheskinmore.wordpress.com website where all those interested in natural and environmental change on the west Donegal coast can share knowledge, understanding and enquiry. to foster a unique collaboration between natural and social scientists through public engagement. Please explore the funding pages for more information about fees and funding.